A detailed travel guide to Isan, northeast Thailand, Korat and Nakhon Ratchasima, with stays on a cowboy ranch, Chokchai Farm, by Jane McLean, from SmartTravelAsia.com, Smart Travel Asia and Dancing Wolf Media. Deep in guitar-strumming country, watch cowpokes lasso steers, and then get down to some seriously hot green curry with local wine. 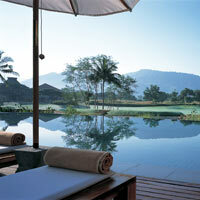 Isan and Korat guide to golf courses, nature, Phimai temples and Khao Yai boutique resorts. THE approaching cowboy tips his hat. “I’m Hunter,” he says. “This is mah gun.” He eyes me warily. Aw shucks, where’s my US visa? It’s the hoosegow for sure. People in these parts don’t take kindly to drifters from over the border. Hunter raises his gun, grins, and points towards the sign reading, “Thongsomboon Club”. He is going to instruct me in the bruising ways of ranch life and horse-riding at this cowboy theme park in Nakhon Ratchasima, a few hours’ drive from Bangkok. Welcome to Amazing Thailand, an ancient land of pristine beaches, towering temples, neon nightlife, sensational shopping and, well yes, green-curry-eating cowpokes singing “Thank God I’m a Country Boy”. I look around. There is nary a horse in sight. There is, however, a chairlift, a flying fox, ATV cars, and a luge. The Eagles are singing peacefully (with an easy feeling) from speakers dotted around the park. The background is stunning – tree-covered hills for miles and a luminous sky casting a magical glow. Tired of tourist kitsch? Fed up of following the herd? Screaming kids in need of a major distraction? Head to Isan, in northeast Thailand, where Thai cowboys face off with Thai Indians, bands warble country hits, tourists ogle cow udders, and classic wineries nestle amidst the natural wonder that is Khao Yai National Park. Peppered across this landscape, just in case you need reminding, are some stunning Thai temples and ruins, mercifully sans-cowboys and injuns. It’s not a Texas, or an English dairy farm, but it’s a pretty good knock-off. First, Geography 101. Isan covers a third of the country with a total area of about 170,226sq km. It’s often referred to as the gateway to Indochina and is divided into the upper region, with the Phu Phan mountain range (south of the Mekong River), and lower Isan, with two mountain ranges (San Kamphaeng and Phanom Dong Rak), and also home to the splendid Khao Yai National Park that borders Cambodia and Laos. On to our Korat guide with a nibble into Isan. This is a vast area with a myriad attractions. It has long been a favourite with Thai holidaymakers. More recently, efforts have increased to pull in more international visitors. Indeed, UNESCO recently registered two Isan locations – Ban Chiang Historical site and Khao Yai National Park – as world heritage sites. It’s a place for soft family adventure, rugged jungle treks if you so desire, and a retreat for wine connoisseurs to enjoy a Thai tipple. While shopping devotees may despair, eco-travellers and golfers will delight in the lack of crowds and the sense of space. Isan presents the opportunity to explore something different – one would be wise to go it alone, rent a car, and just poke around, seeing what there is to find. The roads are good around these parts, some highway signs are in English, but not all. Take a map and a phrasebook. A handy website is www.tourismthailand.org. There is an airport in Nakhon Ratchasima, but there are no direct flights from Bangkok. Other airports in Isan are in Buri Ram, Ubon Ratchathani, Khon Kaen, Udon Thani, Sakon Nakhon, and Loei. Thai Airways (www.thaiairways.com) flies to Ubon Ratchathani, Khon Kaen and Udon Thani. But if you’re just exploring Korat for a couple of days, it’s much more fun to drive. A free-wheeling three-hour drive (259km) from Bangkok will bring you to the city of Nakhon Ratchasima (capital of the province that carries the same name) also called Korat. A taxi from Bangkok to Korat costs around Bt4,600. Alternatively, rent a car. Avis (www.avisthailand.com) is a reliable option and there is a counter at Bangkok’s Suvarnabhumi Airport on the second floor of the arrivals hall. The road speeds through dreary cinderblock factories and higgledy-piggledy suburbia to eventually break free in a flat, green landscape, lush and framed by hills on either side. Fruit stalls dot the highway, piled high with giant durian, jackfruit, pomegranates, apples, mangos, grapes, and pears. Fruit is cheap and delicious. Korat city is home to around one million people and is not the most picturesque of places. But it is a useful base to explore the area. There are a couple of reasonable hotel options including the Dusit Princess near the city centre (rates from Bt1,427, tel: [66-44] 256-629 or www.dusit.com) and Sima Thani (rates from Bt1,400, tel: 213-100 or www.simathani.com) on a busy road near the bus station. The Dusit is a comfortable, friendly place with renovated rooms and a great restaurant offering alfresco dining poolside. There’s a small night market adjacent to the Dusit where you might be encouraged to sample fried crickets after huge intakes of the local Singha beer. Don’t expect a Bangkok-style bar scene here. Korat does have the de rigueur massage parlours and several “nightclub” discos where foreign faces are few and far between. Still, it’s friendly and not overwhelmingly seedy. So what to do? The sparkling gem of the area that surpasses any gun-toting Thai cowboy or performing dog (more on that later) has to be the spectacular natural beauty of Khao Yai National Park. 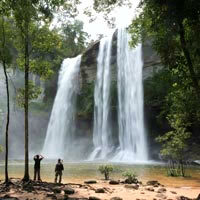 The Dong Phayayen-Khao Yai Forest Complex is a world heritage site and spans 230km between Ta Phraya National Park on the Cambodian border in the east and Khao Yai National Park in the west. There are four national parks in all and one wildlife sanctuary. Needless to say, there’s plenty of room for hiking, bird and butterfly watching, cycling, and even camping. The forest is teeming with wildlife – 800 species up – from animals and birds to reptiles. Don’t be alarmed by the idea of fighting off wild snakes – if you don’t want to go it alone, guided walks can be arranged through the Khao Yai National Park office (tel: [66-8] 1877-3127) or by the National Park, Wildlife and Plant Conservation Department (tel: [66-2] 2562-0760 or www.dnp.go.th). Walks may be short (relaxing one-day strolls through the trees that may take in a stream or two) or slightly more taxing. Four-night treks include fields of flowers, water-rafting, and wildlife spotting. Some of the resorts in the area also organise wildlife tours. Admission to the park is Bt400 (Bt200 for children). On the tamer side of things, and if you like your animals caged, there’s Korat Zoo (tel: [66-44] 934-537 or www.zookoratzoo.com), around 19km from central Korat. The animal enclosures are spacious, and the animals appear to be, well, happy. Unlike a lone elephant I saw, chained to a tree at the side of a road nearby. There are lions, African elephants, giraffes, a couple of hornbills, and plenty more. Zoos are always a family favourite and this one caters to children in a big way. Kids will love the performing seals that clap and fetch balls for fishy rewards – a few too many rewards judging by the seals’ less-than-lithe waistlines. The zoo spreads for miles, but there are bicycles for hire and wagons for easy transport around the park. Moving on to another tourist spot that might appeal to younger folk, or anyone that likes to get up close and personal with a cow or two. Welcome to Farm Chokchai (two-night stays from Bt6,700, tel: [66-44] 4432-8485 or www.farmchokchai.com). The ranch is spotted easily from the road with its ‘Umm!.. milk’ signs painted in bright red on billboards. Chokchai was a cattle farm back in 1957. In 1978 it morphed into dairy farming. Then, in 2000, the son of the original owner returned from the United States with big ideas to add agricultural tourism to the mix. It’s been all go ever since. There are tours of the farm (on wagons drawn by tractors), animal performances, miniature ponies, horse-riding, rodeos, ice cream-making sessions and cow-milking demonstrations. It doesn’t stop there. Want to spend the night? You can, at Farm Chokchai Camp. Try an au naturel open-air loo with tree views and the heady whiff of cow dung. 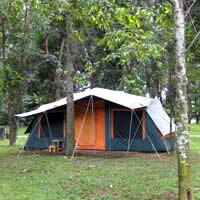 Tents are set up permanently and come with beds, air-conditioning, robes, umbrellas and a chest of drawers. It’s not exactly roughing it, but gives fledgling campers a soft introduction to the Great Outdoors. There are tables set up throughout camp for alfresco dining, as well as a hall for communal meals that involve large servings of beef. More cowboy action can be found at the aforementioned Thongsomboon Club (tel: [66-44] 312-248 or www.thongsomboon-club.com) where, as well as Hunter, the flying fox, and the chairlift, there are Saturday-night shows featuring line-dancing cowgirls, fire-eaters, live bands and barbeque buffet dinners. If the family and kids are in tow and long for a sniff of Americana, save time for a Thailand ranch tour. For a more genteel experience, and perhaps another quirk in a country that is not well-known for its wine-making prowess, there are vineyards to see and wines to sample, some very good ones at that. The PB Valley Khao Yai Winery (tel: [66-36] 227-328 or www.khaoyaiwinery.com) is a 320 hectare plantation of which 80 hectares is grape-growing land. The surrounds are lovely – country lanes, wood barns, fertile flat ground, open skies and forested cliffs in the distance. Guided tours of the winery are available, or you can just sit beneath the vines, breathe in the rural aromas, and contemplate the pleasures of a fruity Chenin Blanc. A tour will come with assurances that wine made at PB “does not use chemicals for processing, unlike in Australian wine”. 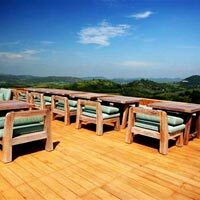 Further down the road, the winery runs a restaurant (The Great Hornbill Grill) that serves up wood-fired pizza on rustic log tables, along with the house wine. Hard to tell if this is Napa, Tuscany or Thailand. The Granmonte Vineyard (tel: [66-36] 227-334 or www.granmonte.com) also has a restaurant that offers home-grown wines including Shiraz and Chenin Blanc. The Village Farm (rates from Bt2,200, tel: [66-44] 228-407 or www.villagefarm.co.th) meanwhile is set on the edge of the Korat plateau, in prime position for a misty cover most mornings. The air is cool year-round up in these parts, offering respite from hot, humid summers. There are vineyards, and also accommodation in bucolic barn-houses. Rooms have names like Sweet Violet, Autumn Leaves, La Vie en Rose, and Lovely Loft. It’s not all flowers and vines – there are modern amenities including a pool, a spa, WiFi, a library, two restaurants and a mini theatre. Room rates include breakfast, dinner, wine-tastings, plus Internet access. 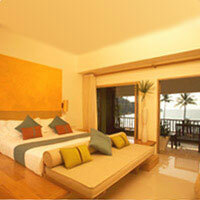 The resort will also provide airport transfers from Bangkok (Bt6,000) if required. 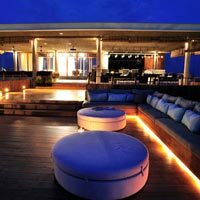 For upscale, uber-chic Korat accommodation, look no further than Kirimaya (rates from Bt7,200, tel: [66-44] 426-099 or www.kirimaya.com). Thai celebs come here to escape the capital’s car fumes, heat, and paparazzi. It’s secluded, and inviting, with an overwhelming sense of calm. 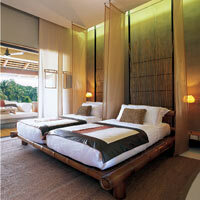 The resort merges seamlessly with its evergreen surrounds. Wood-plank boardwalks are flanked by lotus ponds. The two-storey Dining Pavilion essentially floats on water, looking out over the pool, the golf course and the Khao Yai National Park beyond. The only sounds are the twitter of birds and the occasional clink of clubs hitting golf balls. Rooms are serene and subtle with nature-inspired décor, hardwood flooring, bamboo daybeds on spacious balconies, as well as modern amenities such as TVs, DVD and CD players, with WiFi. Tented Villas come with an extra dose of luxury – 180sq m to play in, plus indoor private spa pools and sweeping unobstructed views of green. If this doesn’t quite transport you to nirvana, the Maya Spa will. Kirimaya takes full advantage of its home at the edge of the forest by organising activities that include bird-watching, night safaris and elephant trekking. Far from the madding crowds, a two-and-a-half-hour drive from Bangkok airport, is the new and intimate SALA Resort Group boutique property sala khaoyai (tel: [66-44] 760-500, www.salaresorts.com/khaoyai). Quirky, classy and accompanied by birdsong, the resort offers sweeping vistas and a genuinely relaxing time away from it all starting at Bt5,000. It's a good spot as well for a high-profile corporate retreat should you be planning a small meeting. Distractions in the area include golf courses, cave exploration, waterfall excursions and “adventure options” such as paintball. As well as the greens on offer at Kirimaya (for golf, tel: [66-44] 426-000), there are other uncrowded golf courses in and around Nakhon Ratchasima province. A round at Kirimaya will set you back about Bt1,500. Mission Hills Golf Club Khao Yai (tel: 297-258 or www.golfmissionhills.com), another Jack Nicklaus-designed course, is about the same price. Cheaper options include Korat Country Club Golf & Resort (tel: 249-060), Bonanza Golf & Country Club (tel: 365-191), Friendship Meadows Country Club (tel: 313-245), Voyage Panorama Resort & Golf Club (tel: 436-298) and The Tiger Golf Club (tel: 354-652). Don’t despair, heritage lovers; it’s not all cowboys, golf and cattle. There are historical sites in Nakhon Ratchasima province – not to the same extent as in Chiang Mai perhaps, but the region has an engaging history. The Phimai Historical Park contains Thailand’s largest Khmer temple site and is about 60km from Korat city. It’s not on an Angkor Wat scale but the temple ruins carry an aura. Built in the sixteenth century during the reign of King Suryavarman I, the Phimai temple construct follows the Khmer Bapuan style that was popular at the time. Unlike Angkor and other Khmer temple complexes of the time that were devoted to Hindu gods, Phimai was a Buddhist sanctuary. As at Angkor, visitors are free to climb the structure and roam the grounds – this doesn’t aid preservation of the site, and the carved sandstone is worn and crumbling in places. 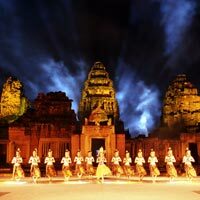 Son et lumiere sound and light shows are held at the temple for larger groups, though Phimai doesn’t need bells and whistles to demonstrate its grandeur. If you do want fireworks, lights, music and dancing, contact the Tourism Authority of Thailand’s northeastern office (tel: [66-44] 213-666) for show details. Commentary is available in a number of different languages including English, Putonghua, Japanese, and French. Tours are conducted by students from the nearby school during weekends and public holidays. The structure faces south and sunset is an excellent time to visit. The Phimai National Museum is about a five-minute drive away. Avid shoppers, be warned. There is not too much to buy in this region apart from wine, and a few other locally-made souvenirs. If you like silk, check out the Machada Thai Silk Factory (tel: [66-44] 441-684) where little old ladies weave all day long. Silk products are about half the price of those found in Bangkok. The Dan Kwian Pottery Village (tel: [66-44] 213-666), on Highway 224, has a wide selection of clay goods. Wineries sell their own products on site. That’s our Korat guide and Nakhon Ratchasima in a nutshell. There is much more to see, but for a relaxing, albeit surreal, weekend getaway a short hop from Bangkok, pack your bandanna and cowboy hat. Thank God I’m a Country Girl.